Designing basic electronic kits for Electric Paint. WHA ARE ELECTRIC PAINT KITS? 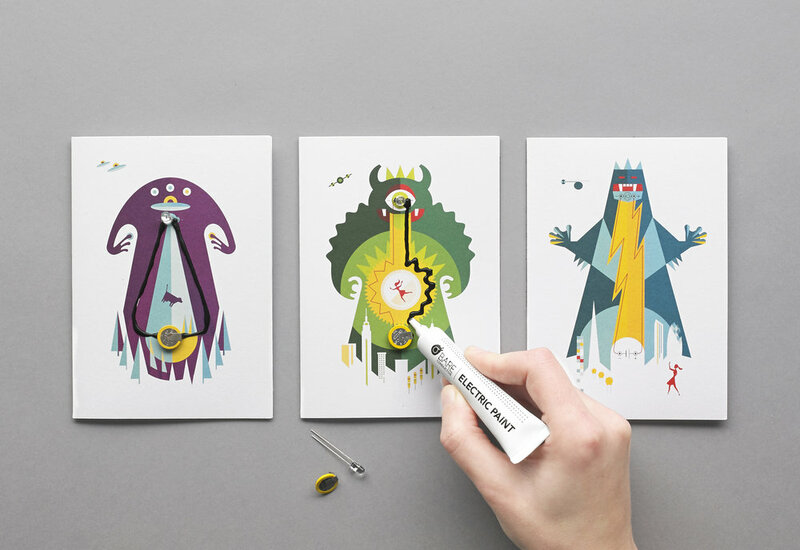 The Glowing House Set and Flashing Card Sets were an entry level product for Bare Conductive's Electric Paint. The kits were with a slight educational angle they were presented more as a fun activity. The kits have now been discontinued as the product range has been reconfigured in 2016. To create engagement with the Electric Paint through making and learning about drawing circuits. 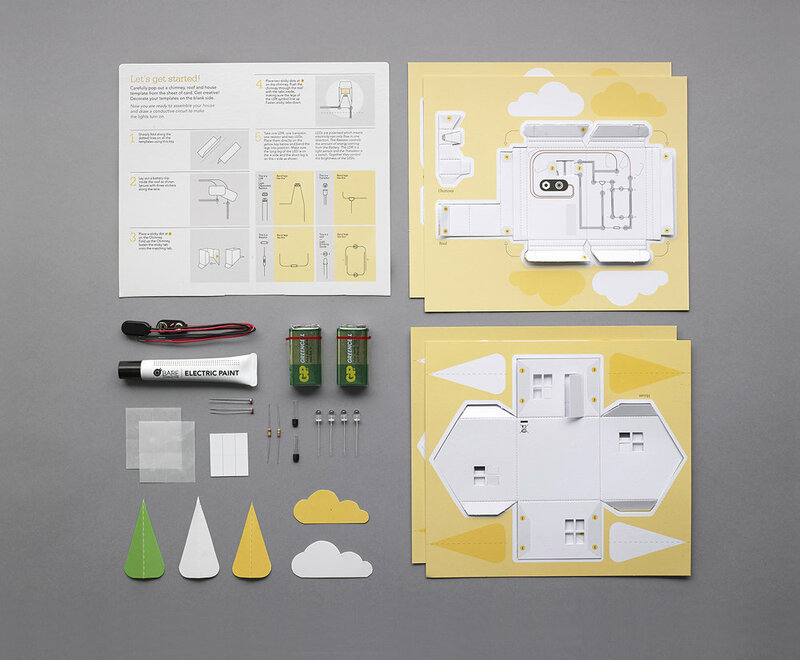 These kits were designed at a point of the company's development when Electric Paint was the only product and the main messaging focused on explaining the potential of the conductive paint applications through fun and accessible activities. This was my first project for Bare Conductive. I was initially hired to illustrate a series of cards which featured integrated circuits guides, which would be painted, combined with the LEDs and batteries by the user. I worked from a prototype initially designed by the team, extending the product rage into four themes. The project then expanded into restyling of the identity as well as packaging redesign, then further into the Glowing House Set, which is a more elaborate version of the cards and features a more complex circuit. Bibi Nelson created the paper engineering for the houses, while my role focused on the entire user experience of the kits as a product system. The packaging brief required the products to attract more retail re-sellers. At the time I received this project the products were sold as digitally printed prototypes in antistatic bags. This was an interesting exercise of taking the company through an identity restyling and pushing the products from e-tail to retail.